The high price of housing on the coasts, population growth in the large metropolitan areas of the south, southwest, and west, and the issue of affordability for low- and moderate-income households across the country fueled the view that housing production was insufficient and that the shortfall was contributing to rising prices and limited housing choice. Indeed, underlying all of the housing-related changes and issues of the 1990s were the factors of supply and demand. The nation grew by 13.5 million households while 13.2 million building permits were filed. Nationally, housing supply was just about in balance with population growth. But substantial variation exists across the country. While people flocked to Phoenix and the housing industry boomed, few went to Syracuse and builders there felt it. The question of supply vs. demand can only be answered locally. 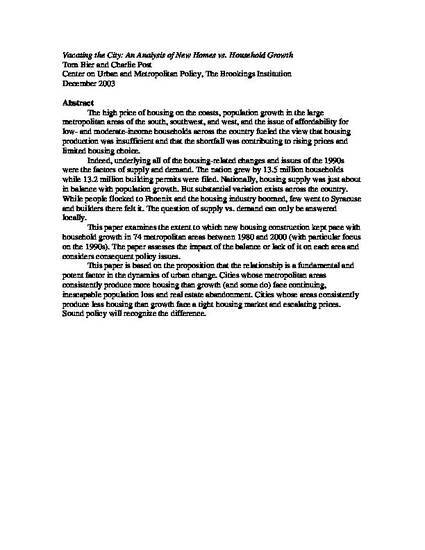 This paper examines the extent to which new housing construction kept pace with household growth in 74 metropolitan areas between 1980 and 2000 (with particular focus on the 1990s). The paper assesses the impact of the balance or lack of it on each area and considers consequent policy issues. This paper is based on the proposition that the relationship is a fundamental and potent factor in the dynamics of urban change. Cities whose metropolitan areas consistently produce more housing than growth (and some do) face continuing, inescapable population loss and real estate abandonment. Cities whose areas consistently produce less housing than growth face a tight housing market and escalating prices. Sound policy will recognize the difference.